Regular readers of the content aggregator Reddit.com may have seen a post recently asking car salesmen to confess their greatest fears. Years ago, car dealerships and their sales force held all the cards, and buyers held very few. But that has changed completely. Now, with information and sites like Edmunds.com's True Market Value (TMV), Autotrader, eBay Motors, and access to car experts in the palm of your hand, you have effectively marginalized the car salesman. You know what they paid for the car, what their mark up is, when they bought it, what their bottom line is, everything. You can, in essence, make haggling a thing of the past. However, if you leave your phone at home, then you better have a terrific memory and be able stick by your guns. Proof is power. 3. Be Wary of Salesmen Who Leave to Let You "Talk it Over"
I actually had this happen to a friend of mine, and I laughed when I saw it come up in the comments. If you somehow manage to get stuck in the salesman's office haggling over numbers, he may receive a call and leave to let you and your partner "talk it over." This is an old trick that some dealers use to listen in on your conversation, letting them know instantly just what your bottom line is. If it happens, whispers or text messages to each other may be a good way to combat eaves dropping. If the car you're trading in is in good condition, you won't be getting a good deal on it. Sure, you're armed with the Kelley Blue Book (KBB) trade-in price and resale price, but those numbers are hogwash. Dealers use something called the National Automobile Dealers Association (NADA) database, which gives them a much more realistic idea of what they can get for your trade. Some of the salesmen reported KBB values that undervalued cars by $5,000 or more. Your best bet is to get a copy of the NADA value for your car. Or, if you can, sell it privately instead. Dealerships refer to them as "bumper stickers" because that's where they bump up the price of the car. Little extras like VIN etching, fabric protectants, sealants, and other "must have" additions can all be done by you at home, usually for way less. Ask to see the original invoice, and compare it to the bumper sticker. That's what you really want to look at. If they refuse, go elsewhere. And even then, the invoice doesn't tell the whole story. See fear number 10, below. Those two things below your waist, called legs, are a sales weapon. If at any time you don't feel good about the sale, you can walk away. Often, the salesman will hit you with a much lower offer when you get up out of your seat and tell them you've decided against it. Remember, they can't do the deal without you, and you are always in a position to say, "NO." You lose nothing but a few hours of your time; they lose a commission and a bonus. Even if you get the salesman to agree to a price that is basically what the dealership paid for the car, you still have to go to that back room; the room where the deal is sealed. Whether you lease, finance it, or plonk down a wad of cash, they'll try to push every single option they can on you. That includes an extended warranty that you can buy way cheaper from someone else. The dealership makes a lot of money on these service contracts. Don't fall for this. As one of the salesmen pointed out, the finance manager is actually a salesman, too. They're going to do whatever they can to squeeze more money out of you before you leave. There have been many, many negative articles written on the four square worksheet, and with good reason. The four square sheet is a way for the salesman to "play" with the numbers and make you think you're getting a great deal. Usually, the first time they come to the table with it, the numbers are so insulting you'll want to walk out. That's intentional. They can't look like miracle workers if they give you a reasonable price. And then the numbers game is played out, but the price of the car rarely goes down more than a few bucks. However, there's a better way to show just how this is used to trap you into a price you really don't want to pay. Read this article, written by car salesmen FOR car salesmen. It's quite an eye opener. And as one redditor advised, tell them not to bring out the four square worksheet or you're leaving. That puts you in a position of power, and they'll know you're no sucker. You drive into a dealership with your trade in. The salesman looks it over, nodding, giving the usual chit chat. But he'll ask things like "does it have power steering?" or "does it have a sunroof?" He already knows the answer. He knows the spec of the car and what it's worth. He just wants you to say NO a lot. And by saying no over and over, you start to devalue your trade in, and expect less for it. Get the NADA value, and whatever he asks you, just keep that number in your head. Another method is taking the keys from your trade in before you sit down at the negotiation table. It's a lot harder to walk away when you don't have your keys on you. They know this, and will often give the keys to a third party, like their sales manager. Now, they have to hunt him down before you can get your keys, and that will take a while. Long enough for them to have another crack at you. You hear people say it all the time. "I'm paying invoice for that car, not a cent more." Well, go ahead, it's better than paying the MSRP. But very few people will pay MSRP anyway. And the invoice price of the car is not telling you the whole story. The dealership gets dealer holdbacks, customer rebates, and factory-to-dealer incentives. This is money they can take off the sales price and offer to you, but they won't just hand it over without a fight. These incentives are usually not even advertised, but they can save you thousands. The salesman will ask early on "how much are you going to put down?" It seems like a reasonable question, but you're giving up a bargaining chip way too early. One story talks about an old man who had $10,000 to put down on a truck, and the dealership basically upped the price of the truck to offset that down payment. In effect, the old man threw it away. Wait until you know the "Out the Door" price of the vehicle before you talk about a down payment. You should have a figure in your head of what you can afford to pay for the car, NOT for the monthly payment. The reason is simple. A dealership can mess with the figures, the length of the loan, and the APR, and reduce your monthly payment, but you could end up paying even more for the car than you first agreed to. Look at the final cost, and only the final cost. If your monthly price for that is too high, you're spending more than you want to. If the cars at the dealership get hail damage, they're going to mark them down and sell them to you at a discount. Great, a bargain, if you don't mind the dents. But the dealership has insurance policies on the cars on the lot, and they've already been reimbursed for that damage. The dealership is not passing all of that on to you, so you're generating some nice profit for them. Many dealers will add "extras" to the car that cost them pennies on the dollar. Pin striping, rims, spoilers, stereo systems, alarms, you name it, they'll throw it in. Negotiate from the invoice price, not the padded sticker price. You don't need to pay $250 for a few bucks worth of pin striping. You don't need floor mats that cost $200. If it's non-factory, ask for it to be taken off. All of it. Do it yourself, or get a trusted mechanic to do it. And you can also get your tinting and clear bras done elsewhere for around HALF the price the dealership will charge. This was the one point that kept coming up over and over. When you go through the Internet sales department, the dealership already knows that you know certain things. They know you're a savvy shopper, that you're looking around, and that you're comparing prices. The Internet salesman will start at a much lower price than the salesman on the lot. In short — don't walk onto the lot unless you're going in to meet the salesman you've been dealing with online. You can negotiate way better terms in advance, with a credit union or another financial institution. Don't leave it up to the dealership; get this all pre-approved before you walk in. So you get caught up in the financial meltdown and agree to pay for a lot of extras, including the extended warranty, tire protection, and so on. Well, you are not stuck with them. You can cancel within 30 days and get your money back. You can also use this to your advantage. Agree to the service contracts if you get money taken off the price of the car. The dealership makes way more from the service plans than the car anyway, so they'll be happy to make the deal. When you cancel, you're in the money. There were many more tips in the reddit.com thread, which I urge you to read. And remember, these all came from people who make a living selling cars. This is straight from the source, and well worth remembering. 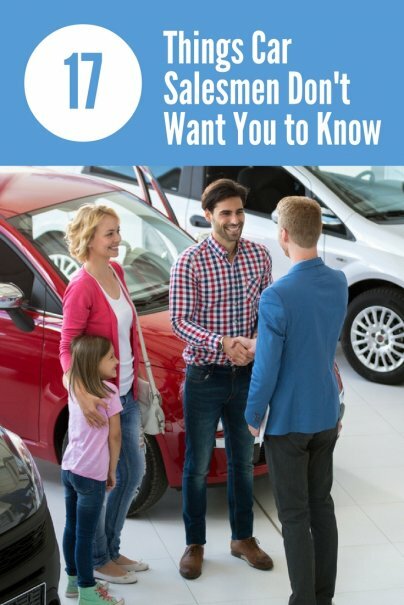 Are you a car salesman with more information to share? Let us know in comments below. It's a shame that you have to be middle-aged before you get to be an expert on buying cars. Salesmen don't mess with me anywhere near as much as they did 20-30 years ago, and I'm sure it has more to do with the lines on my face and general lack of hair on top of my head more than a general reform of automobile sales practices. Meanwhile, this should be required reading for anyone under, uh, 40 who is about to go through the ordeal of buying a new car. In particular, I usually do #2 before setting forth. I found a really good deal on my current car that way and brought printouts just in case. We have a special way of dealing with #3. Do all your conferencing in some language other than English. German works for us, and my German is sufficiently bad (and my wife's English sufficiently flawless) to give the salesman the clear impression that we're not doing it because we just came off the boat yesterday. The best way to avoid situation #4 and #9 is to only bring in trades that are barely running. If the car is a jalopy to begin with, there isn't very much the salesman can do to knock you down from the $500 it's probably worth. In fact, you usually get offered more than that $500 in the hopes that it will make you so happy you'll not notice the other ways you're being hosed. As for #5, #7, #14, imagine you're two years old. What's the easiest word that comes out of your mouth (other than "mine")? It's "no." Say it often, and with authority. I usually say, "I just want the car. That's it." Do that, and you'll never have to do #17. Note this also applies to tires and large appliances. #16 is a given. The credit union is right next door to the car dealers. First I get my loan pre-approved, then I go shopping. That also takes care of #8, #11, and #12. No it is not the fact that you are old. It's the fact that we actually care. Back in the day any salesperson did not care quite at all if the customer was satisfied, they just box pushed the easiest purchase and torqued the customer until they bought. This is not the case now a days, if any dealer is worth your time and money they will listen to what you are asking for, be fair about things and take of you like family. Anyone who tells you, you are getting "screwed on your trade" is purely not true. The vehicle may have dings and dents, that the client has forgotten about. Or it has rust or mechanical trouble or other problems. Cars are depreciating assets and every day they are on the road they lose their value. No vehicle will appreciate unless you are driving something vintage. If you drive a common sedan you will get common money for it, it is that simple. There is not much money in a vehicle. We charge a certain price for our products because we install them professionally, the fact the author of this article wrote that "VIN Etching" can be done at home makes me cringe because a certified technician from for example "Sherlock" has to do it. We do things a certain way because that is how the manufacturer requests it to be done and if for example ruin something on the car doing an installation of something, we have to pay to fix it. We also guarantee every product we sell you, there is the value in having it done through us. If the salesperson is being transparent with you, don't think they are playing you. Most salespeople these days are transparent, like myself. Integrity and honesty are the name of the game, if you don't take pride in what you do no one will come back to buy from you again and there you go, short term sales long term nothing. As for warranties being for "suckers" yeah that can't be farther from the truth. That is like saying insurance is for suckers. Down the line after the manufacturer warranty has run out you will thanking your lucky stars for the extended warranty. I see many clients that come and say the reason they want a new car is because they DONE putting money on repairs. The extended warranty may seem like a lot up front, but in the long run when the car lasts you eight years being fully warrantied and you not having to drop a cent on maintenance but brakes, tires and windshield wiper blades, your pocket will be happy and you will be much happier. You can stretch the longevity of your vehicles life with a single warranty. Drive the car longer, get better bang for your buck and spend less money in long term. As for the "four square" the reason why we use it is because the majority of people who sit down with their significant other or their friend use this method. It allows us to show different options of purchase or lease. We do not manipulate the figures, legitimate salespeople are in this for the long-run. Manipulating a client only creates negative feelings towards the salesperson and the dealership. This again does not create return clients which is how we make our money. If you give a good service and make the client understand what we are talking about and both parties feel good about the transaction then we did our job. It's all about the clients, no happy clients, not a very productive and long career. As for us "playing with your head" and asking random questions about the value and options on a car. We do not know until the car is evaluated. We ask you these questions to make the evaluators life easier so we can get the evaluation done promptly so you do not have the spend hours in the dealership. Your time is valuable and we take that seriously. Also if we do not investigate your wants and needs properly you probably won't be interested in the vehicle that we will show you. By asking for your vehicle options, we can get a basis as to what you are used to driving and we can then discuss if you would like something equally equipped, less equiped or more equipped. We don't play with our client's heads, that just leads no where. If you are paying invoice there is a reason for it. Cars in high demand will not be sold for a deal, it's like a Tesla, they do not negotiate. If the salesmen asks you early on how much you want to put down, they are not interested in finding a vehicle that will build value for you. They just want to go straight ahead to payment so they do not have to actually do their job. The dealer has to be able to come up with the reason why the payment is that high. The dealer can't just put the monthly whatever they want and expect the client to just pay it. That is not good business practice and here in Canada actually incredibly illegal. If you buy accesories of course your price will cost more, otherwise its the taxes, borrowing cost, msrp, dealer fees for vehicle preparation and any applicable rebates that create your monthly payment. At my dealership, if a car is hail damaged we don't even try to sell it...it just get's brought to auction...In fact we don't get reimbursed because every vehicle has a certain deductible and if the insurance pays for the damages we are obliged to fix it. Most dealerships do not pay the deductible for the insurance because it's usually above 5000$. Then just increases with every claim so it is not intelligent to do it that way. Most dealers actually take a massive hit for a damaged vehicle because they usually get sold at auction for a much much cheaper price and the dealer loses loads of money. You do not get the best deal from the internet salesmen. Low price maybe, but value no definitely not. The internet salesmen usually does not qualify the client. He does not assess their needs. If for example you tow on a daily basis (because you are in landscaping) 8000LBS. Currently you are looking at a light duty pick up truck, and the internet salesperson does not know this. You agree on price, meet up and buy the truck and then you realize that you miscalculated the amount the truck which now is 7000LBS. This might not seem like much, but down the line you will hurt the truck and then have to either buy a new one, strengthen it or keep fixing it. A true salesmen has his customer's best intentions at heart. Be wary of those who only talk price those ones are the true sharks in the water because they actually do not care about you. Non-factory aftermarket parts are not added unless the customer asks for them. No one these days does that unless they want to get stuck with a modified vehicle. Not one dealer where I am from modifies any vehicle unless it is pickup trucks and that does not happen that often either. Modifications occur only if the client asks for it. Getting your own financing can be a good idea if the interest rates are higher than normal. Majority of places have their interest rates floating around 0%-2.99%. Getting a line of credit for example will get you an interest rate of around 2.4-2.8%. If you buy a vehicle that is above 2.8% it's understandable but dealerships usually offer better rates than the banks because now almost everyone has their own financial institutions that allow for way better interest rates than the average consumer can get through their financial institution of choice. Reason being: dealers deal in volume, so they have the best ways to negotiate with the banks for the best interest rates out there. You can cancel the contract, but all of my clients don't because I actually take care of them. If a salesperson is honest with you their is no reason to cancel, it has to make sense for all parties and that's why I am doing well where I am. We are not the scum of the earth trying to squeeze every dollar our of clients. We are honest individuals trying to make a living, just like you. Cut us some slack and I promise that you will get a good deal and above all the right vehicle to fit what your wants and needs are. Listen intently and let the salesperson go through the motions with you. They do this because they care and want to make sure that the vehicle you end up driving will serve you well for the years to come. In Oregon it is state law that if you as the customer can provide a salesman with physical proof of a set sales price, so an advertised price on say a website or newspaper. The salesman is required to sell at that set price and cannot heckle you for a higher rate. Is there any other states that have this rule? I'm having this issue in Georgia. Same issue at a Long Island Dealership. Are they allowed to leave Sticker on car in and if you make Genuine offer can they say "it is being offered at 10K over sticker". There was no sticker saying "Additional Dealer Markup $10,000" on the vehicle. It's because of postings like this that people get screwed every single day. Dealers don't get extra cash if they hit a certain number. I worked in Dealerships that sell 400 cars per month. Also you talk about doing your homework, why would a dealer pay to advertise a car $35000 but somehow you think that you should offer $30000. Trade values, if you go to KBB and price out your car 100 times it will come back with the exact same number 100 times however its safe to say that not every car is in the same condition. Also the market changes on some of these cars daily. Just last month is was buying cars off lease at $39000 now 30 days later I can buy the same car for $31000. Yes there is many dealerships that play games and take advantage of people but that isn't the majority. I'm yet to come across any sites that actually understand the car business and give consumers the right advise. Let me start by just being nice and if the people at the dealership are nice back to you just leave and take your business somewhere where they will value you and appreciate you. But for starters stopping reading posts like this because this is just someone that has probably never worked in a dealership and he or she did they are the dirtbags that they are complaining about. I TOTALLY Agree with Guest on this. Well said. That was so more helpful than this lazy article. I completely agree that your smartphone can be your most powerful weapon in negotiation. I remember buying a dishwasher and getting a discount because I pulled out my smartphone and found the appliance online for less. I think I saved $100 or $200. Important stuff to know! Thanks so much! This article does not apply to any legit, honest car dealer. Most big dealerships hire and train people that know nothing about the car business, therefore they are trained to make the most profit and not to educate and help the customer. Btw four square is for suckers (the movie). Any dealership using four square should not be in business. Please dont make all dealers look bad with one article. Bought my first (and last) new car in 2002 - last because I'm still driving it. Loved the salesperson, paid $100 more than my target price (which I had figured out ahead of time) and have had a very happy 11 years with my car. But my husband will NOT buy a car or truck without the extended warranty. Finally decided it was worth it to keep him happy, and we ended up getting almost exactly our $ out of it when the air conditioning blew up around 95,000 miles. Last time I went looking for a car while my husband was very ill. Darn salesperson wouldn't even talk to me because I was there without my husband. Gave him and his manager, and later the owner an earful on that. Why go through this mess?They have much more sales experience than you do.You can't win this fight.I and my cheapskate relatives have found the BEST way to buy a car cheap.You,first,figure out what car you want.Then you watch the ads in the newspaper for the loss leader,one only, deals.You get to the dealer early and buy that car.You may not get the exact color or features,but you get a great deal,without all the hassles.You don't do finance,pay cash.You don't trade in a vehicle,sell it elsewhere.You don't buy any extras or warranties.You keep it real simple and no opportunity for the dealer to add anything. I am reading this, and the one thing that keep popping into my head is that "some it is true, but it make the client its own worst emeny." Now there are some clients that like to play the race to the bottom. However, as an example with tades, the article states "Dealers use something called the National Automobile Dealers Association (NADA) database, which gives them a much more realistic idea of what they can get for your trade." I call BS on that! Yes there are some Dealerships that still use that. However a auction price is a real figure for a trade in and most people who use the internet researching their trade-in knows that. Another thing is the "Never Offer to Pay Invoice for Your Vehicle" line. I have a huge issue with this. For some dealerships, this is the only way they make money. Somethines depending how the dealership is set up, they lose money depending on the salesperson commission. This trains people to start from invoice minus holdback. This article is telling people that us, as salespeople can make a living and we work for free and I do not like that! Any TruePro-fessional car sales person has no fear from any of these. Garbage that perpetuates a false stereotype. 30 years... 3 generations of customers.. all of them happy in the extreme. CWDarling. I am a car dealer. My name is Jared and I'm 22 years old. I am the youngest dealer currently in the state and have been for 4 years now. I don't want to give the wrong impression, I had much help from my father. He himself started his own dealership at 21, and did very well for himself. He would tell me stories of the 70's and 80's and how car sales were so different back then. From what it sounds like, car salesmen back then were pretty much exactly how you discribe them in this article. Times have changed my friends. As stated so kindly above, we have smartphones, computers, online local listings for "private party" ads that can be filtered instead of thumbing the newspaper. We have technology folks, and let me tell you the secret to finding a "good" car salesmen. Honesty. The reason I have made it and am growing in these last 4 years is plainly that; honesty. I embrace the fact everyone has access to this information! Makes it easy on me. At the auction when I'm buying cars and have a mobile app that scans the vins barcode, instantly showing me kkb, nada, and wholesale value. Not to mention carfax and other history reports on the vechicle. I know exactly what I should pay for something while the "I have been doing this since before you were born" are still thumbing their Kelly blue books. PS- side note, all that bollochs about dealers using some sercret booking system for trades call "nada" is totally ridiculous. That's available to everyone and gives even less value than kkb. If there's a secret "book" it's called "black book" but even so the values of cars change literally every week so it's honestly pointless. What I do for my customers, walk out with them scan the vin and see REAL numbers, auction valves from the previous week. But be realistic, if your car is junk then don't think it's worth high book. You come back from a test drive and you want the car. The salesmen comes out and says how'd it drive? You say great, then, "what's the BEST DEAL you can do" the honest salesmen replies, 22,000. And you know this is a good deal because you did your research and the car books at 28,000 clean retail. You haggle him again, "we'll ill buy it for 20,000" the salesmen replies, 22,000 is the best deal I can do? I paid 20 for it... You leave because he wouldn't come down again. He sells the car to the next customer. Later that day from a new car store you are push into a car you didn't want, and you payed to much for. It sounded like a better deal because he lowered the price a whopping 8 times! Holy cow what a steal. Not. Wake up and be smart. If you want to be treated with respect then show some! If a salesmen tells you the bottom dollar and it is reasonably under the book value I promise he doesn't have anywhere else to go! That's it. Don't counter back at a ball busting 2k under his BOTTOM dollar you just asking for. It's the people like that who make sales mind games. Just be honest and be smart. If its a good deal to YOU then it is. That's not the case sometimes. I bought my first car at 20 and I was totally ripped off. The car had a terrible rust issue with the undercarriage and the salesman knew it. He asked my budget I told him and he told me he was giving me a deal. No haggling. No arguing. No anything. A few months later the rust starts to cause problems in the car. I get it looked at by someone else and they're horrified that it was even sold because it was badly rusted. It was a used car sold "as/is". I go back and he won't do anything. I was driving a death trap that could have fallen apart at any moment on the highway and that salesman didn't care about my life at all. Forget selling a car with a bad engine (which is crappy); the frame of the car was rusted and could've fallen apart while I was driving it. By the time I finally got around to getting the highest price from a junkyard, parts of the car were literally hanging from that bottom, just waiting to fall. All of this happened in 3-4 months. So, you many be a good salesman and your dealership may be decent, but you have to respect the bad experiences that some of us have had with the people in your position. So, if we ever cross paths I will question everything you say. I will ask you the same questions 3-4 times repetitively to see if you give the same answer each time. I will question your knowledge. I will question your pricing. I will question the "deal". I will bring knowledge and an expert with me and compare it to your knowledge. Don't take it personally. I just don't trust car salesmen. You make salesmen sound vile and heart less. If you knew anything about the industry or the job role, I bet you would retract everything you said. I went into Nielo after confirming on the phone a car I wanted was available. Salesman said it was on the lot. He was gone when I got there, but had another intercept me. Marched me around the lot looking for it- couldn't find it. Went inside and checked the computer- not there! Then they tried to sell me something else. I'll curse salesmen for the rest of my life. I don't envy you. You have your work cut out for you! It's funny how a good majority of these comments come from "car salesman" themselves. The simple fact that negotiating is even necessary to buy a car should let you know that must tread carefully. I don't negotiate for a loaf of bread or a can of soup. But buying a new car is completely different...and why? People are inherently selfish and any car salesman that calls himself altruistic is a lying sack of ****. In all fairness, you are trying to make a living. I get that and most people do. The problem isn't your trade, but the shady practices that surround it. Many of you say the sales tactics listed on this site are antiquated. Well I beg to differ because "every time" I purchase a car, I go through the same shenanigans but from different dealerships and sales personnel. It's almost 2015 and nothing has changed. Your job is to separate a "mark" from his money. Your concern isn't a happy customer, but putting food on your table. If you have a pleased customer, then that's just icing on the cake, but it's not your prerogative, nor should it be. I don't do my job to please my boss or my customers. I do my job for the same reason you do yours.. a paycheck. The difference between my job and a salesman is that I'm not lying to people in an effort to line my pockets. This isn't to say that other jobs are above your own. Everyone cuts corners from time to time, milks the clock, etc. The difference is that I’m willing to admit this fact. Cut the **** and be honest. More often than not, you'll probably never see the customer again. Myself and almost everyone I know has never seen the salesperson again unless they randomly saw them in the streets or were a repeat customer. People don't buy cars to forge relationships with salesman. I think the tips listed here can save uninformed car buyers some real stress if they heed the advice. As for the salesman, we appreciate your in depth knowledge of the vehicles and your assisting us in finding the right vehicle, but stop acting like you care about the customer because we both know that you don’t. It's funny how you say you don't go to the grocery store and try to negotiate for a can of soup. You don't have to do so at a dealership, either. Just walk up to the car and pay what's on the sticker. You don't walk into a grocery store and tell them you're not paying full retail for that can of soup, are you? You wait for them to put it on sale and then get it later, which is what car dealers do. Try asking the store manager to see their invoice cost on soup. Offer the cashier 1$ less than retail for that soup. Can you negotiate at a store? Absolutely not. Can you do so at a dealership? Yes. Customers are empowered not to pay the full amount, and dealerships made that monster. So the next time you're out car shopping and don't want to haggle or go through games, just walk in, pick out a car and pay whatever the sticker says. Just like grocery shopping. If your buying a car know your math don't go into a dealership expecting a $300 payment for 60 months on a $50,000 vehicle. To be honest I don't care about any opinion. None of this is a fact. People are different. Salesmen are as well. You want to feel as if you didn't get taken. Education is key right? I wouldn't buy something I didn't like. I don't force my customers to purchase any. We simply ask! Those old days of shady scams are over. If you paid to much it's your fault. Use the Internet for pricing. I have plenty of customers that I speak with weeklyx monthly and have bought multiple cars from me. Believe what you want. I don't lie to them nor do I have a reason to here. Don't bash salesman because of your mistakes. No business is going to lose money.. The "Old days" of "shady scams" are over? Why were they ever around to begin with? Education is key? Dealerships tell prospective customers "here's what NADA says", or "here's what KBB says - even though I don't put any stock into them since Cars.com bought them out", and then when the customer says the same thing in reverse they are uninfomed and need to trust the dealer. F*ck the dealers. It's a scam and a b*llsh*t system that we can't buy directly from factories and have to give any money to the leeches of American capitalism. I don't trust you, I won't trust you, and I will try to lowball every one of you scumbags until this system is replaced entirely and you can go out and get real jobs that promote prosperity in this country instead of leeching off others with your forked tongues. The vitriol I have for car salesmen is unmatched by anyone other than lazy bottom feeding system-abusers. Seriously?! These are things we don't want consumers to know? Who wrote this tripe? Carfax is the best friend of the consumer? Carfax is useless, Autocheck is the most accurate tool that a consumer can use. The best tool a consumer can use, honesty. Don't lie to the salesman, whether it's about your trade, your credit or anything else. I've been in this industry for over 30 years, from service, to the sales floor to management. In all that time I never lied to a client, and the majority of sales staff I worked with never did either. To paint us all with the same broad brush is unfair and perpetuates a stereotype that is for the most part not accurate. The best "tool" that a buyer has is the word no. Don't be afraid to say no if you don't like the terms of the deal, explain what you don't like and you will find in the vast majority of cases that the dealer will be amicable to your request. Reasonable Doc fees are a legitimate cost, so don't be put off by them. Most of these "helpful" tips are provided by former salesman who couldn't sell to save their life. Not by the men and women that have made auto sales a career, and are proud to do it. The best advice? Use common sense. It's that simple. Do salesmen also recommend to purchase vehicle reports from other alternatives like AC or VinAudit? They say CARFAX has a bug for a moment so I was about to get my copies through their coupon but I just want to make sure if the reports are accurate. That was the longest single sentence I ever read. I use monthly payments to my advantage. After careful research, I know how much I will pay for the vehicle/options, the best interest rate available to me, and knowing my down payment and I can calculate my monthly payment. I then walk into the dealership and tell them I am willing to pay my calculated monthly payment minus $25. I bought an iPad recent for $499 plus tax. I asked them if they could do $499 tax included and they looked at me like I was crazy. I KNEW they were making more profit then they DESERVED. I mean really, these things are made by cheap labor forces in China and I DESERVE things at a lower price then what they are advertised for or what the manufacturer suggests they retail for because I'M a SMART CONSUMER. .... SO I took my business to the local Staples and bought a yellow notepad. MUCH MUCH lower price and I can write all of the stuff I need to on there. Take THAT APPLE. How DARE YOU try to make me pay a premium price for something that, even though I have no means of making it myself, I am entitled to get for a lower price. Thanks wisebread - let's continue turning middle class paying sales jobs into minimum wage crap jobs. It's not like car salesmen do anything anyway! None of them spend any time in training sessions or in their off time to learn what they're selling and actually help people make a decision that works for them. The internet allows me to know everything. Leep up the good work. Here's just a thought...don't go to freakin used car lots...of course you're going to get hosed! All new car dealerships sell used cars, certified cars, and new cars. Ask for the blue book, nada, and black book on your trade...no reputable dealership is gonna offer you lower than those numbers...cause that's what the car is worth! In terms of 'only paying invoice' or never paying 'msrp' ...do you think car dealerships are non-profits helping to cure cancer hoping you'll donate?? It's a for profit industry that supports thousands of human beings who have families to support just like everyone else. Be reasonable, I work for a large dealership that's family owned...we are payed salary - not comission off gross. Look it up, all dealerships will show you the blue book, black book, and nada on their car...most the time they are listed below value cause again -this is the age of the Internet - you can look up every car in a 500 mile radius...of two cars are both exactly the same but one is listed at blue book value and one is $1,000 cheaper...which one are you going to go see? 4. Monthly payment...cause it's the 22nd century and that's all most people care about now. Those fir areas are all you're gonna talk about...so if you want to be an idiot and talk about each one separately and take 4 times longer...than go for it...cause it literally changed nothing. The article example talked about a 21% interest going to a 7% and from 24 months to 60 months...for real?? Dealership ask you - what do you want your payment to be, on what term and what interest rate - crazy manipulative right? We tell people to go get their own financing, bring us that interest rate cause guess what 90% of the time we can beat it...we're not locked to one financial lender we can go to work for you as a dealership and tell a bank they need to beat this rate on this term cause guess who banks would rather have as a partner a one time car buyer or an entire car dealership sending them hundreds of business a year...who do you think is gonna get the better rate. That's just straight up logical if you can get a lesser rate...you get a lesser monthly payment...why wouldn't you do that and how is that manipulating you? Ask for the blue books, black books, nada on your trade and the car you want to buy...in fact most dealership will show you exactly what they paid for the car, paid to service it if it's used...tell you how much profit they'll make and simply ask you how much profit are you comfortable with us making...cause we are a for profit industry. 95% of this article is 'well duh' and the other 5% just flat out wrong or ridiculous....'I'll give you a minute to talk' if you think that's a closing technique you're right...cause guess what people want privacy to talk about their finances and what they can or can't do, you're rudiculous if you think that's to manipulate or anything other than a customers request 90% of the time. The information or traps to avoid given by 'real salesman' are a during bred...the are the forefathers of millinial salesman...and they earned the worst reputation in almost any industry...the deserve it, and can't understand why people are only willing to be vague with them and super diffensive. They don't realize that they're literally a century behind, back in their day people would go to an average of 7-8 car lots before buying - no internet, today people spend an average of 7-8 hours on the Internet and only go to 1-2 car dealerships - Internet has killed the the sleeze car salesman...they're still out there for sure, but their methods are so easy to spot that you are just an idiot if you don't leave those lots. This list isn't tips or what to do's to buying a car - it's a list to identify a dinasor dealership that isn't sleezy and deserves everyone of these customer defensive tactics against them. But the reality is...it should be a list to get the hell out of there cars there's a new generation of car salesman...and we don't have time for that ancient sleeze bs. It's gonna come down to us and one other salesman at one other lot 75% of the time...it's a showdown and why would I wasts my time on stupid manipulation methods from the 90's when you can google every word I say to you live to see if I'm lying or manipulating....I'd have to be an idiot - not to say there aren't idiot/manipulative car salesman. Every DMV requires a power of attorney if the party isn't present to process their own tags. I have worked in auto sales for more than 10 years. Several years as both a salesman and several as a sales manager. This list is nonsense. The market has changed drastically and the only way to sell cars today is to stop selling! I preach the importance of helping our customers buy the right vehicle, not selling. And I can assure you that working for Toyota dealers for 5 of my 10 years, markup is not plentiful, even on very expensive Toyota models, rebates are small compared to domestic brands, and dealer holdback is not something we can easily give up or we couldn't meet payroll or keep our utilities on. Stop with the internet bashing of car salesmen and dealerships. Going in with a strategy to "beat the dealer" will only make it more difficult for you to leave happy in the vehicle you truly want. I would like to know why you're so against the car dealership making a profit? The car dealership is like any other business. They have employees from the guy who washes your new car to the title clerks who take care of all that DMV work so that you don't have too. Salesman who have to teach you about all the features of your new car, educate you on their product and the compititions. These employees do this work for the same reasons you get up and go to your job everyday; to support themselves and their families. Car salesmen work hard, and the good ones will work hard for you, so that you can have a pleasant car buying experience. When you go buy a car with your boxing gloves, on looking for a fight, you're setting yourself up to have an unpleasant experience. Your about to spend $20,000 for a car that is going to be a part of your life for the next ten years. You'll drive to work, pick up the kids from school, make memories with your friends, and take you whereever you need to go without fail and will sacrifice its self to protect you if your ever in an accident. Isn't that worth something to you? A small overall percent of your purchase to the business that has just assisted you in what is more in likely the second biggest purchase you'll ever make in your life. If you went out for dinner and racked up a $32,000 dollar tab, wouldn't you tip those who serviced you? I don't go the dry cleaners and figure out exactly how much it cost them to clean my shirts and then force them take exactly that or I'll go somewhere else. I don't mind paying a profit to business for goods or services I pay for. This is America. If you can afford it however your paying for it, (month to month or all at once) why not be reasonable and just be happy about your new addition to the family? I'm going through a painful process of trying to get quotes over the Internet but car dealerships are getting smart. They won't provide a quote - I must go into the dealership. They say they don't want to "upset the marketplace". Talk about collusion. For all you poor salesmen who profess your honesty and integrity explain this to me. The car I wanted has a mrsp price of $28,400. Using Unhaggle.ca I find the dealership paid way less. The sticker price at a local dealer was $39,000. Oh I feel so sorry for you poor salesmen who are being bullied by awful customers who actually want to negotiate. Eavesdropping, sealants, hail damaged bargains? Your advice is 20 years old if this is what you think of the car business. I bought a car from a dealer, he got me financed through a bank, I already have a payment book and the dealer still has not giving me the title and its been almost 2 months. The bank says I have to pay for it anyway or the dealer has to buy it back. Dealer says no. What can I do so I can just give it back to the dealer. And what can I do about the bank. Please help. I sell cars and I keep going to work every day when customers hate me to see if i can change their minds about how the expect to be treated and so do all mo coworkers. we are not out to get you . we are out to help you and will spend house helping you and skip lunch and keep going when we are so hungry we feel we may fall over to help you. There is no games we are trying to help you. You think you have a deal, only to drive off the lot with a horrible set of tires. Yes, they will give you "deal" and then screw you on a lot of things....bad tires, etc. Take a measurement with you and check the tire tread. Then subtract the cost of the tires from their best price. #7 about extended warranties being for suckers really angers me! I don't think you know what you are talking about regarding any of the points in this article and for those who read this and trust that you are telling the truth and that you are giving good advice you are being completely irresponsible. I'm a senior manager in a dealership and have been for 25 years. I am specifically involved in the service and parts operations. Every single day we encounter customers who have purchased extended warranties/extended service contracts from companies outside of the dealership because they found out that, yes, they could buy it cheaper elsewhere. The reason I'm so certain that we encounter those customers every day is because they are upset and/or angry about their warranty company not covering repairs or short paying the repair. The ones I love are when the warranty company does approve the repair and sends us the parts........USED PARTS!!! That's when you'll see a customer hit the ceiling! The facts are that the dealer extended service plans ARE more expensive but only because they cover so much more! Dealer extended warranties work seamlessly for the customer in that they are integrated with the dealer and the customer never has to get involved and make calls and complain to an outside company. The customer has a smooth service experience without the stress of multiple calls and that's all before it comes time to make payment. Many dealerships have been wronged so much by those outside warranty companies when it comes to payment that they no longer accept outside warranty companies payment terms. The dealers used to only collect the deductible for the covered repair and let the customer go about their day. The dealer would then wait for payment later. Then, their warranty companies would short pay the dealer or begin negotiating the price after the work had already been completed and if they did not pay by credit card they would take another 90 to 120 days to make payment. That doesn't include the amount of time the Service Advisors spend calling and sitting on hold forever while the warranty company rep's went through the estimates with a fine toothed comb! Advisors will tell you that calling outside warranty companies is among the worst things they do throughout their day! Just to make it all clear I believe the author of this article has written a very inaccurate and irresponsible piece of trash here and he owes his readers an apology! I will issue the author a challenge - come to my dealership and let's watch for a day or two without anyone knowing who you are and let's see if you can support your claims!!!! Give these poor sales guys a break! Why doesn't anyone go bargain with electronic retailers, furniture outlets, phone manufacturers etc. which are all ridiculously over-priced???!!! If you were all smart you would just lease the damn things 0 down and only use factory lease cash FREE MONEY GUYS. NO MONEY OUT OF POCKET. Oh and i have sold cars before everyone doesn't get the best deal PERIOD. its called credit you don't know how to manage your money and pay your bills and get the rates to get things cheap and you want someone else to pay half of it. LOLOLOLOL. those of you with money, hahahahaha get over yourselves. keep reading articles although your couple of current sales reps that have responded are 100% CORRECT Give respect, be fair. They are in the customer service side now, not the rip you off deal after deal and make tons of money, yes some do but allot dont make more than your average living. And frankly they are allowed that for all they do. I have a question to anyone that may answer or has any type of information on it please feel free to comment I bought a used car, I didn't have insurance on it yet. I left the lot and literally not even 5 hours go by and I get in car accident. now from what I've heard the car dealership used car dealership place has insurance on it is that true? And I have also heard that they shouldn't have let me drive off the car lot without insurance on it is that you as well ? I am a car salesman, and frankly, I am very tired of people posting articles like this that make car salesmen seem like they are all pure evil and don't care about the customer at all. First of all, this is 2016. Car salesmen are more honest and up front then ever. Every person I know at my dealership is just trying to make a living like everyone else. So why is it that everyone else in the world can make a living doing their job, but when car salesmen try to do it we are labeled as evil crooks? We all have families to support, hobbies to pursue, we are all just trying to make it by like everyone else. The profit margin on new cars is smaller then ever. People think that I sell them one car and I get 2000 dollars or some ridiculous figure like that... not so. I sold a brand new car for FULL STICKER PRICE, and the profit on the deal was.... drum roll please... $307. At FULL PRICE. And most people don't pay full price. Most of the vouchers I get for my commission show negative profit for the dealer on the car, but of course nobody in the world will ever believe that we are losing money on the car, because everyone has been trained to believe that salesmen are inherently the Devil. Oh, and about "destroying whatever profit margin they were hoping for. And before you feel too bad, the dealerships get massive bonuses by hitting certain sales targets. They can give you the car at cost and still walk away with a nice pile of cash." Yeah... the dealership does get bonuses. But guess what? We salesmen never see a penny of that. That all goes to upper management. We only get paid directly on the profit of the vehicle. Sometimes they give us small bonuses for selling certain cars, like older models that aren't selling, but usually that is only about $100. And the average commission for selling a car is about $100 per car.... Take the average of ten cars a month, subtract taxes, and you'll see that we are basically working for minimum wage. And believe it or not, we are actually honestly trying to make you a good deal that is fair to BOTH parties involved... We want to make a living to keep bread on the table and keep the lights on, AND give you a fair deal at a payment you can afford. We want to KEEP YOU HAPPY!! It benefits us, because you may come back and buy another car from us later, or maybe send us a referral or two. And if you are not happy with the deal, we get hurt also because our bonuses are tied to customer service scores... If a customer leaves you a bad review, you lose ALL OF YOUR BONUSES! And those bonuses are pretty much the only way to make money with the small profit margins on cars these days. So why would we ever do ANYTHING dishonest or try to cheat you? The last guy at my dealership who lied to a customer got fired. There are definitely some sleazy car dealers out there, but they are not the majority. We are just trying to earn some money and take care of our families, the same as everyone else. So please stop treating us like we are trying to give you the plague. 1. Most salespeople make an average of $40,000 per year. There are some veterans that pay attention to their customer base that could make 6 figures or more but it takes years of service and loyal customers to get to that point. 2. There is not as you call "piles of cash" in terms of mark-ups in these new vehicles. Most domestic products have $800-2700 in mark-ups before rebates. 3. I love how you made us sound like spys as we let the customers "talk it over" a while. Do you feel we bug the offices to get important information to close the deal? I laughed aloud at that one. 4. I have been appraising cars for 18 years and have never used NADA to evaluate a cars worth. NADA are for insurance values and on the contrary those values are higher than wholesale numbers. Most dealers here on the East coast use Galves and auction data to figure out what cars are worth. If dealers used NADA to evaluate cars they wouldn't be able to resell them and make any profit. 5. 54% of cars qualify as "good condition" on Kelly Blue Book. A tiny percentage I believe 4 or 5 % qualify as excellent yet you encourage your reader to never accept a "good" appraisal. 6. Extended warranties are essential when buying a new car today. Yes, there are cheaper warranties available from companies that wont be honored at most dealerships. If I bought a Ford I would want a Ford warranty. If I bought a Jeep I would want a Chrysler warranty. I wouldn't want a generic warranty that costs $500 lesser but covers 1/3 of what the manufacturers warranty covers. 7. And dealer invoice is a good deal. In fact when I started $300 or $400 over dealer invoice was a good deal. If you could get a deal at invoice it is fair. If you get a deal slightly below invoice it's an excellent deal. We shouldn't have to sell a car under dealer invoice unless it's a slow turner, a leftover, or a tough seller. There were some truths in your article such as the internet being a great tool for the consumer and the fact that the buyer has the edge. Other than that I was offended by your article and feel it was written by someone who has never stepped foot in a dealership one day in their life. I always had a policy of not talking politics because I am not into the topic nor understand a lot of the going ons. I suggest you do the same with your ignorant view of my business.